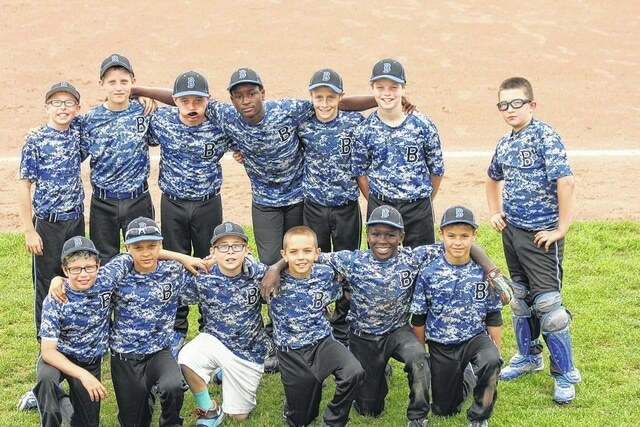 Submitted Photo The 11U Mid-Ohio Bullets finished their season with a 26-8 record. They were the Marion Presidential runner-up and placed fourth out of 60 teams at the state tournament at Bowling Green, losing 5-4 in eight innings to Alliance Elite, who went on to beat Marysville 7-2 for the championship. They won their first six games in the state tournament to reach the semifinals. Also, they won their division in COYBL with a 9-1 record. On the team were, bottom row (l-r): Marcus Cortez (Northmor), Trenton Ramos (Northmor), Bohdi Workman (Northmor), Isaac Blair (South Central), Max Lower (Northmor) and Sam Seidel (South Central). Top row: Griffin Workman (Northmor), Marshall Shepherd (Shelby), Andrew Armrose (Northmor), Pierce Lower (Northmor), Caden Eichler (Lexington), Jeremy Holloway (Shelby) and Gavin Whited (Northmor). Not pictured is Brock Church (Big Walnut). The 11U Mid-Ohio Bullets finished their season with a 26-8 record. They were the Marion Presidential runner-up and placed fourth out of 60 teams at the state tournament at Bowling Green, losing 5-4 in eight innings to Alliance Elite, who went on to beat Marysville 7-2 for the championship. They won their first six games in the state tournament to reach the semifinals. Also, they won their division in COYBL with a 9-1 record. On the team were, bottom row (l-r): Marcus Cortez (Northmor), Trenton Ramos (Northmor), Bohdi Workman (Northmor), Isaac Blair (South Central), Max Lower (Northmor) and Sam Seidel (South Central). Top row: Griffin Workman (Northmor), Marshall Shepherd (Shelby), Andrew Armrose (Northmor), Pierce Lower (Northmor), Caden Eichler (Lexington), Jeremy Holloway (Shelby) and Gavin Whited (Northmor). Not pictured is Brock Church (Big Walnut).